Title: 101 Things You Thought You Knew About The Titanic...But Didn't! Summary (from Goodreads): People have an endless fascination with the Titanic, yet much of what they know today is a mixture of fact and fiction. 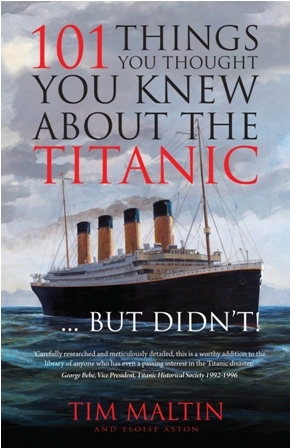 In one hundred and one brief and engaging chapters, Tim Maltin, one of the foremost experts on the Titanic, reveals the truth behind the most common beliefs about the ship and the night it sank. From physics to photographs, lawsuits to love stories, Maltin doesn't miss one tidbit surrounding its history. Heavily researched and filled with detailed descriptions, quotes from survivors, and excerpts from the official inquiries, this book is guaranteed to make readers rethink everything they thought they knew about the legendary ship and its tragic fate. A few months ago, my husband and I had the pleasure of going to the Titanic Museum in Branson. Not too long after did I receive this book for review. I don't think the fascination of this event will ever get lost in history. If you have any interest in historical elaboration or this specific event in general, then this book is definitely for you. It is full of information and they even include interviews with Titanic survivors themselves, including crew members who had behind-the-scenes details before and after the event. It was like I somehow had a first-hand connection to the Titanic. I was a little nervous reading this title, because you have to be wary of whether or not the author actually did their research, or they're feeding you a bunch of their own creative theories. It seems that Tim and Eloise really did their research providing a Bibliography and Webliography in the back, and not to mention the numerous interviews they sought. Everything was organized nicely by topic as well. The only thing I would complain about is although it is filled with intricate detail, sometimes there's just a little too much detail, especially in the interviews. I think the conversations could have been condensed down and more to-the-point, instead they were left feeling a little "fluffy." Nonetheless, it was still just as fascinating.